Treatment for Sore Throat – Slice a lemon and extract the juice. Cut the peel into small pieces and mix them with the juice. Heat the mixture then add honey, depending on your tolerance for sourness. Now, drink the mixture. Your throat will gradually clear up. Just repeat the entire process if your throat gets clogged again. Aide for Metabolism – Drinking lemonade everyday can help increase your metabolic rate. The acidic content of the drink is abrasive for most substances, especially the broken down food particles in your stomach. Once lemonade mixes with your gastric acids, the rate of burning particles increases, boosting your metabolism. Skin Care – For dry skin, you can use a lemon-sugar scrub, or rub a cut lemon on particularly dry areas, such as knees, elbows, or heels. Be careful when applying to cracked skin. Drains – Lemon rinds can be ground in the garbage disposal to freshen the drain. Hot water with a little lemon poured down a drain will also freshen the drain. Bleaching – Lemon juice acts as a natural bleaching agent. 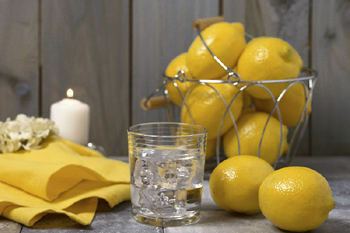 Put lemon juice onto white linens and clothing and allow them to dry in the sun. Stains will be bleached away. Copper – Clean copper-bottomed pots and pans with lemon juice. Copper fixtures can also benefit from a lemon juice cleaning. Cut a lemon in half. Dip it in some salt, and clean spots from your copper. Add To Vinegar – Vinegar can be a great cleaning ingredient, but many people dislike the vinegar smell. Adding lemon juice to vinegar when cleaning can help neutralize the vinegar smell. Countertops – Countertop stains can be removed by allowing lemon juice to sit on the stain for a few minutes. Scrub the area with baking soda and watch the stains disappear. Don’t leave the lemon juice sitting for too long. It can be powerful stuff. Remove tea kettle mineral deposits: thinly slice a lemon peel, place into kettle. Fill with water, and bring to a boil; remove from heat. Let set for one hour, drain, and rinse. Freshen a cutting board: After washing a cutting board with soap and hot water, rub with half a lemon, let set in juice, and rinse. Clean and deodorize your microwave – By placing 4 tablespoons of lemon juice in 1 cup of water. Place in microwaveable bowl and boil for 5 minutes. The condensation from the boiled mixture will enable the microwave to be wiped out easily, and will deodorize the oven. Natural Insecticide – Lemon contains an ingredient that is generally disliked by insects. That ingredient is called D-limonene. If you’re out on a camping trip and you suddenly run out of insecticides, you can boil lemon juice or extract, then place it in your tent. You will be surprised on how a simple solution can repulse pests like mosquitoes and mites. Natural Ant Repellant – Spray lemon juice around the areas that you see ants in your house or outside in the places where you think they might be getting into your home. Natural Weed Killer – Believe it or not, you can use lemon juice instead of harmful weed killers to get to those hard-to-remove weeds that always come back, particularly in the cracks of your sidewalk or driveway. For more efficiency, put the lemon juice in a garden hose filter, and soak the area thoroughly. You may also be interested in this book from Amazon, The Complete Idiot’s Guide to Green Cleaning, 2nd Edition only $11.93. This book is fully updated and revised to focus on cleaning the “green” way-naturally, with no chemicals-this guide takes readers room-by- room, teaching them how to clean thoroughly, efficiently, and in an environmentally sound way. New and expanded coverage includes info on making small changes that have a huge impact on cleaning difficult areas, green-ifying personal care products, and more.